1. A current carrying conductor is found to carry 10 μA at a given time slot from 5μs to 1.5 ms. Find the total number of electrons flowing in the conductor during this time slot. 2. For the given circuit, use KCL to calculate the current at node A, where, i1= 6.5 A, i2 = 1.5A and i3 = 5 A. 3. Given that the voltage drop across R1 and R2 are 6V and 4V respectively, use KVL and calculate the values of the resistances. All data is given in the diagram. 4. 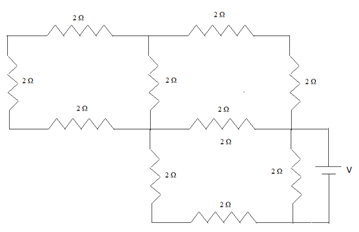 Given the following circuit, determine the value of Req . All the resistances are 2 Ω each. You may name the nodes as you want. 5. In the given circuit, find the current and voltage in each resistor using Ohm's Law and KVL. circuit for the buck boost regulator connected to a ic regulator , my voltae range is 5v to 24v?